Remove spyware, kill pop-ups and protect online privacy. Is there a better alternative to Internet Cleanup? Is Internet Cleanup really the best app in Internet Utilities category? Will Internet Cleanup work good on macOS 10.13.4? Stop your personal information from being transmitted over the Internet. You choose what information you want protected, and only a password can unlock it. If you are tricked onto a non-secure Web page, Internet Cleanup's Personal Info Protector will prevent any of that protected info from populating any forms. Version 5.1.1: Release notes were unavailable when this listing was updated. Surveillance programs watch your every move. Don't let someone record what you type, track where you go, or take snapshots of your screen. Internet Cleanup 4's enhanced Network SpyAlert™ makes it even easier to stop programs from making secret online connections and stop spam emails from reporting back home. Pop-ups are distracting and annoying. Banner ads can slow down your surfing to a crawl. Netblockade™ will filter ads selectively or turn them off entirely, block pop-ups and pop-unders, and even block Flash ads! 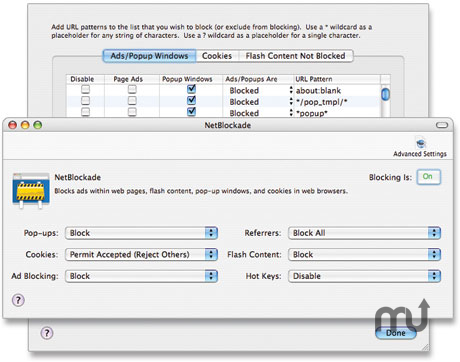 NetBlockade supports all major browsers, including Safari, Firefox, and IE. Strip unwanted attachments from Apple Mail, Entourage, and Eudora emails without deleting the text message they arrived with, automatically! With the SmartRules™, you can sort through thousands of email for particular attachments, then delete, move, or archive them! Wield total control over third party Web cookies, or let Internet Cleanup's enhanced and automated cookie management handle the cleanup tasks for you. Erase Web browser histories and cache files, erase Instant Messenger chat logs, and more. Browsers store the Web pages you visit! Anyone can easily examine your Web browser's cache, cookies, and history of sites visited! Internet Cleanup 4 supports more browsers than ever before! Tossing private or confidential files in the trash doesn't prevent them from being recovered. Even emptying the trash won't protect you from prying eyes. Shred those Files! Secure Delete™ ensures your files will be permanently overwritten and completely unrecoverable.